May flowers–it’s such a cliché–but one that I’m going to embrace on this balmy May bloom day. The pinks in my garden seem to be front and center at the moment. Dusty pink blooms of this Red yucca, Hesperaloe parviflora, pop against a backdrop of Soft-leaf yucca foliage. While the blooms adorning a different Red yucca bloom stalk flash a bit of yellow–just enough to keep things interesting. …and many more will follow during the long growing season. In truth, this is a plant that is floriferous in moderate drought; lots of rain produces lots of leaves, but fewer blooms. 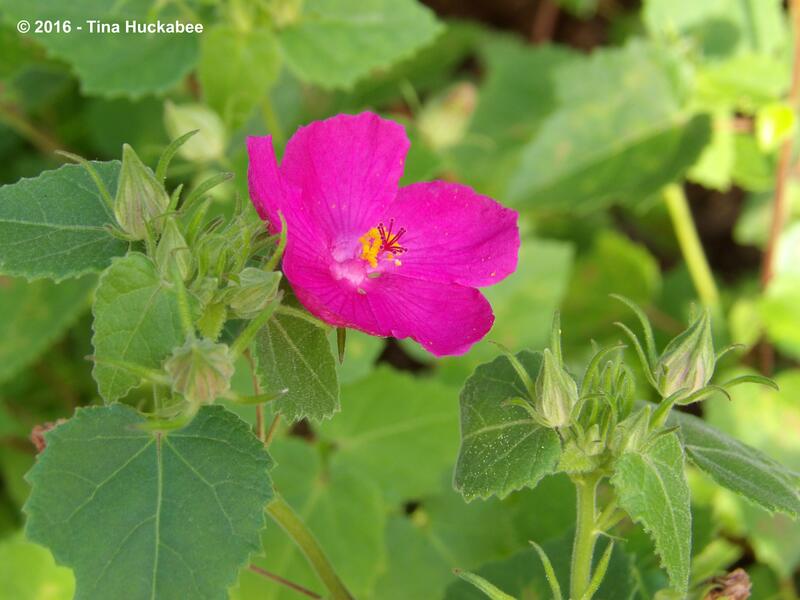 No matter, our summers are reliably dry and the multitudes of Barbie-pink blooms will turn heads as they open early in the morning, close by mid-day, throughout the long summer. 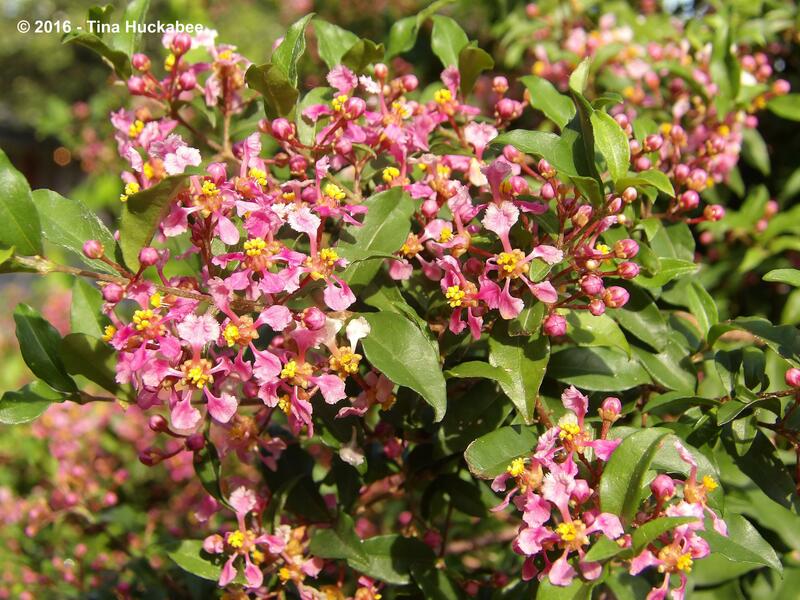 The pollinators and the gardener will enjoy the on-n-off bloom cycles of this hardy, small shrub well into October. 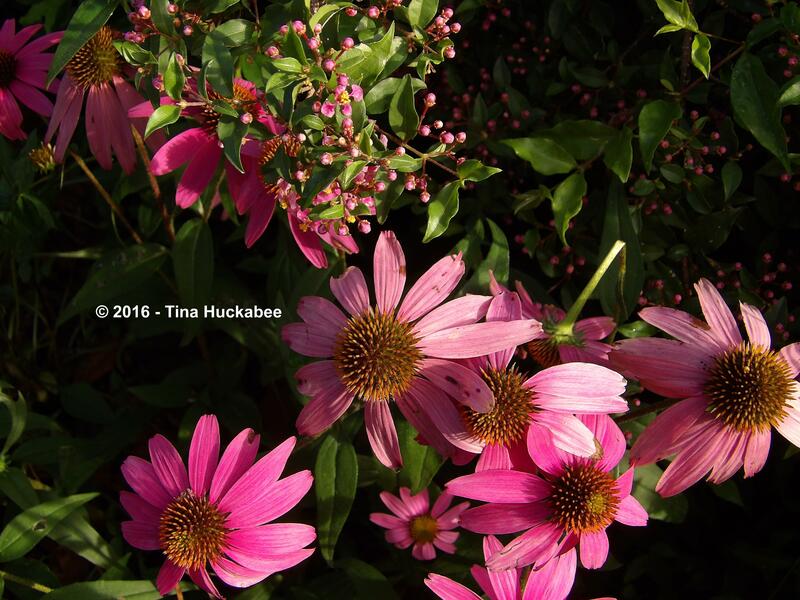 Purple coneflower, Echinacea purpurea (which look pink to me) are in full spring show. And the large shrub, Barbados Cherry, Malpighia glabra, is blasting the garden with its clustered version of the pink and yellow combo. Additionally, the Barbados Cherry blooms fill the air with a lovely fragrance. You can’t smell the blooms while reading this post, but the fragrance is special–a May garden delight. Barbados Cherry and Purple coneflower are pink pals in the garden. Pink does not rule all of my garden though. The yellow (Aquilegia chrysantha) and yellow-red (Aquilegia canadensis) Columbines are on their way out, having bloomed since late February. However, they’re still producing for the pollinators, with some energy set aside for future seed production. Columbines soldier on as spring wanes and the temperatures warm. 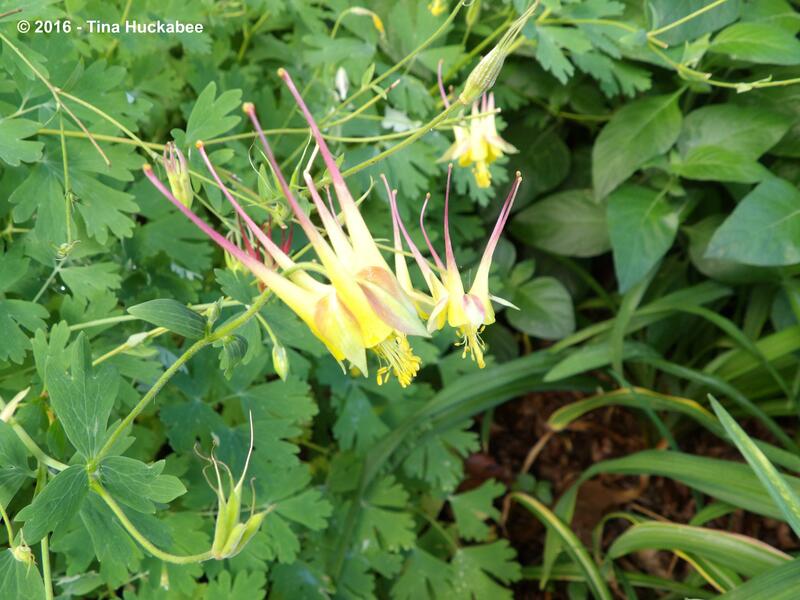 A cool season plant here in zone 8b, I miss Columbines when they’re done, but always enjoy their fairy-like, shooting-star charm in the cool spring garden. 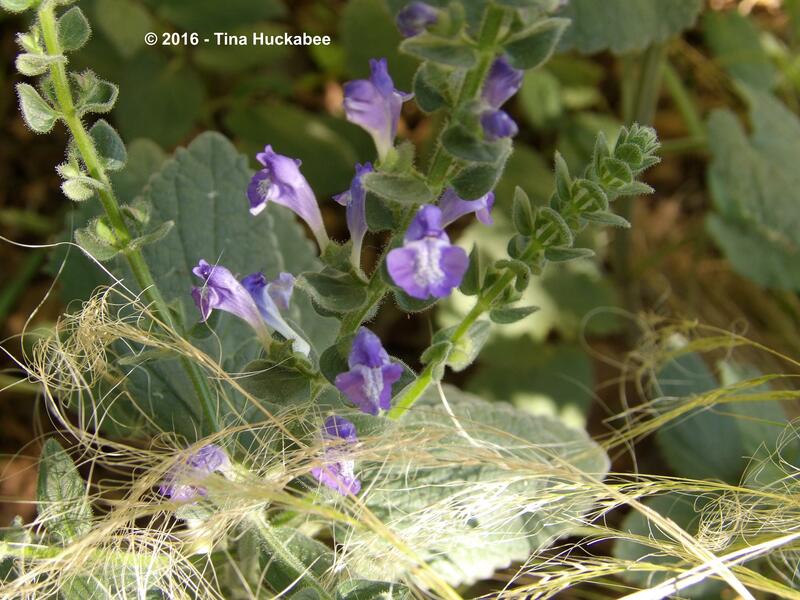 Heartleaf Skullcap, Scutellaria ovata, is filling the back garden with drifts of grey and blue. 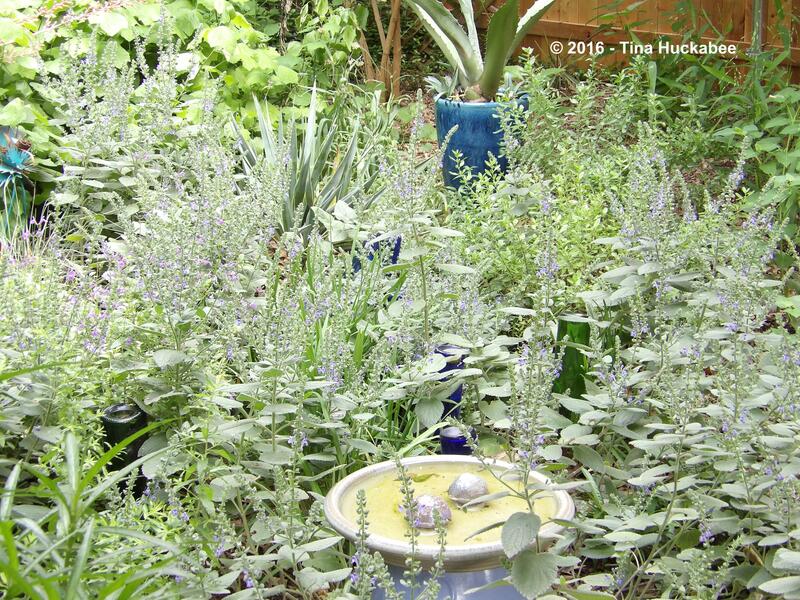 While Majestic Sage, Salvia guaranitica, is truly grand in the royal blue it wears. Finally, the creamy blooms of Twistleaf yucca, Yucca rupicola, have made their once-per-year appearance in the front garden. Poised atop the tall (5 foot) stalk, they beckon to native and honeybees to sip and gather from their floral bounty. Once the blooms are done, I’ll trim the stalk–maybe drying it for further use as a stake for some wayward plant later in the year. The foliage is handsome, year-round, lending structure and evergreen sturdiness to the garden. Somehow, I managed to choose photos of all these blooms with not a single pollinator in sight. Pollinators are in the garden and in abundance–nectaring and pollinating, even if I didn’t capture that particular beauty in this round of photos! Fortunate to live where May blooms are plentiful, I thank Carol at May Dreams Garden for hosting this monthly bloom frenzy known as Garden Bloggers’ Bloom Day. Join in, share your garden pretties, then click over to her lovely blog to see and learn about blooms from many places. 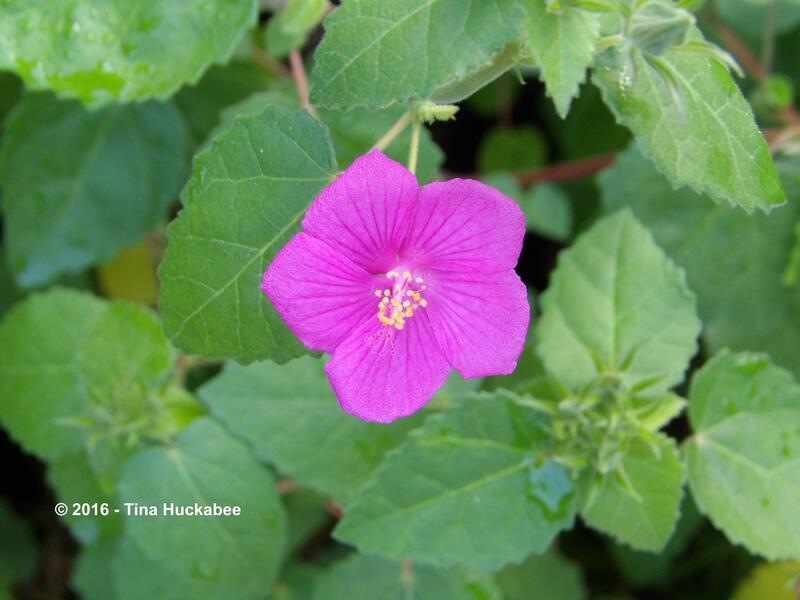 This entry was posted in Barbados Cherry, Heartleaf Skullcap, Majestic sage, Purple coneflower, Red Yucca, Rock Rose, Texas Columbine, Twistleaf Yucca, Uncategorized and tagged Garden Bloggers' Bloom Day, GBBD by Tina. Bookmark the permalink. Your blooms are looking great. 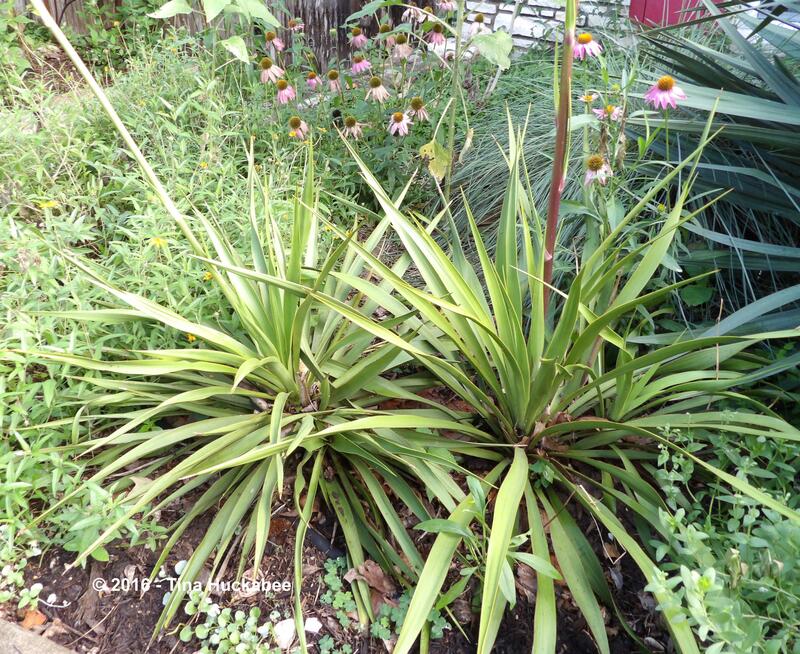 Does the Twistleaf Yucca bloom every year? Yes-ish. It takes a few years to mature, then it’s reliable as a bloomer. There are two in this spot and this year, they’ve both sent up bloom stalks. Yay!! As I recall, last year, only one bloomed. Lovely May blooms Tina, although they look more like summer blooms to me. What an abundance of lovely and unusual plants you have. Thank you, Chloris. Some of these are summer blooms–late spring through fall–a long growing season. Oh, that Red Yucca bloom is something special! I had to chuckle at your mention of balmy weather at the beginning. We are having the opposite experience right now–cold weather is unusual, even for us, in May. I hope we’ve seen the last of it until next fall! Happy Bloom Day! 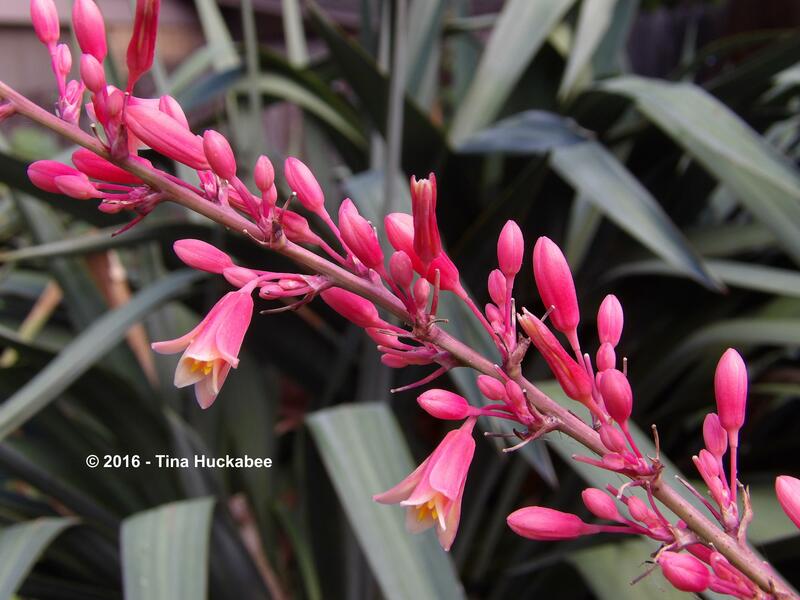 Red yucca is a lovely and long blooming plant–a real winner! It’s too bad about the cold, but maybe you’ll enjoy some warmer temps going forward! Happy Bloom Day to you, too! It is interesting to see your lovely red yuccas, because I’ve only see white before. Everything looks so exotic in your garden, except for the scutelleria which I have just spent the weekend digging up from the front garden. Boy does it spread! The twistleaf yucca blooms are gorgeous. They look like they should be edible somehow. Thanks for sharing! Lovely blooms! Your post and particularly the Barbados cherry has made me reconsider pink and yellow together. Whenever I do it accidentally, I always think it’s a mistake – but here’s nature doing it and it looks terrific! Thanks, Cathy! Yes, I think pink and yellow can be a bit too cutesy and that may or may not be such a good thing. In looking around my garden, I have quite a bit of pink–didn’t mean to, necessarily–but the plants I choose tend toward pink, at least during this time of year. I looked at your country as it seems the plants are tropical-ish. Yucca thrives here but i haven’t seen that one yet, i should be int he lookout. Lovely blooms there. Andrea, almost all the plants that I profiled for this post are native to Texas. 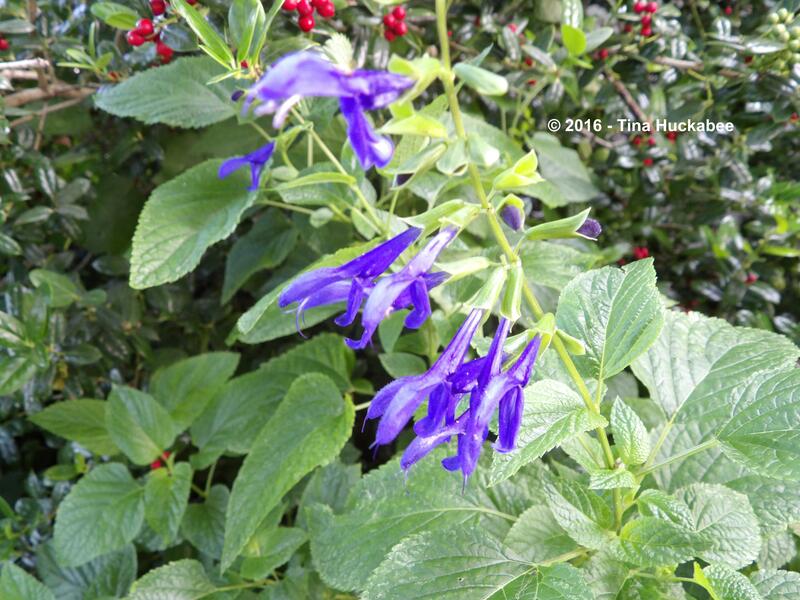 The only one that isn’t is the Salvia guaranitica, which is native to Mexico and Central America. Hi Tina all its flowers are magnificent. Yuca red red flower color is very rare: only I had seen cream; it’s marvelous. Flower Barbados cherry, pink and yellow, it is precious and if it gives off a fragrance garden is great everything is. The soldier is cute Aquilegia: columbines adore. The Majestic sage with the contrast of the deep blue flower and silver gray foliage is unique in beauty. The Twislteaf cassava with its cream color and that forama of bells is very nice, well native bees feed is very important. Thank you very much for teaching us so many beautiful flowers and its beautiful garden. Greetings from Margarita. Thank you, Margarita. 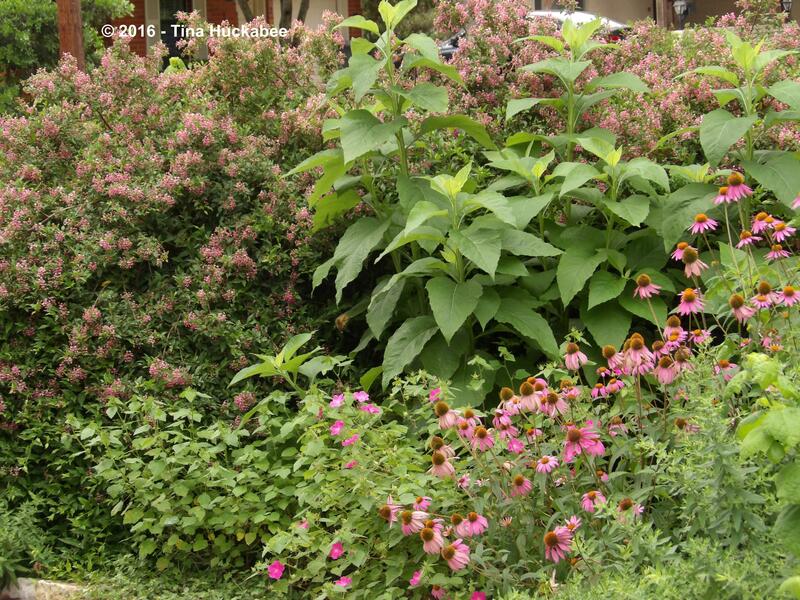 The plants are mostly native plants to Texas, so they’re very hardy and grow well. The Majestic Sage is from Mexico, but our climate is not all that different. Tina thank you very much for the explanation of where the plants come. Are you a well of wisdom. Greetings from Spain Margarita. SO much to love here… It is so interesting how even across town the flowering times can vary. My coneflowers set a few early blooms but most of them are just kicking into gear and won’t be showing flower stems for days yet. The yucca are sure into full displays everywhere however and I’m putting twist-leaf on my “watch to buy” list. Gorgeous! That’s good to know about the pavonia – I’d wondered why they were looking so leafy but not blooming much – now I know! Always fun to learn something new while enjoying beautiful photos. Yes, it is amazing how a few miles can make such a difference. I’ll be cutting back the pavonia and some other things soon–too much green and they get floppy and bloom less. Boo!! I’ve loved my yucca. I’m not one of the spiky plant lovers, but I do love me some yucca! The Rock Rose has such a vibrant color. 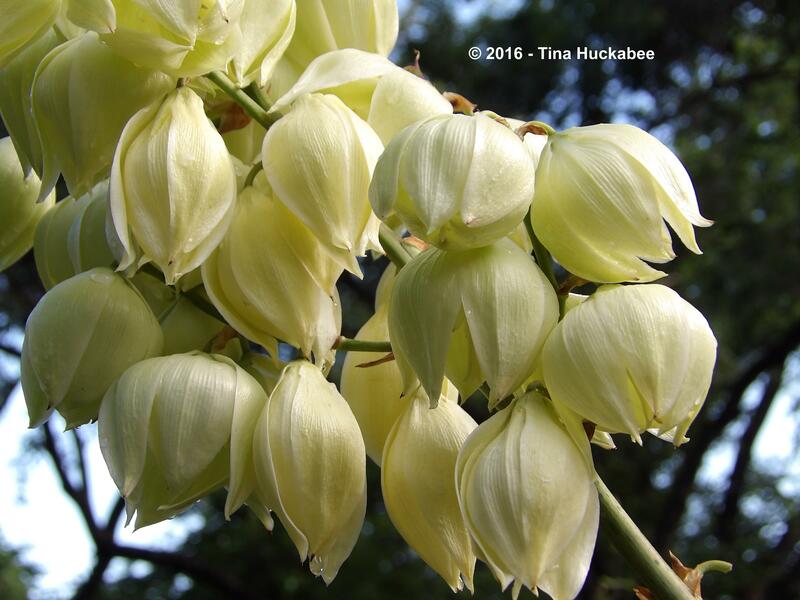 Love the Yucca flowers, too. Barbie pink appeals to all. 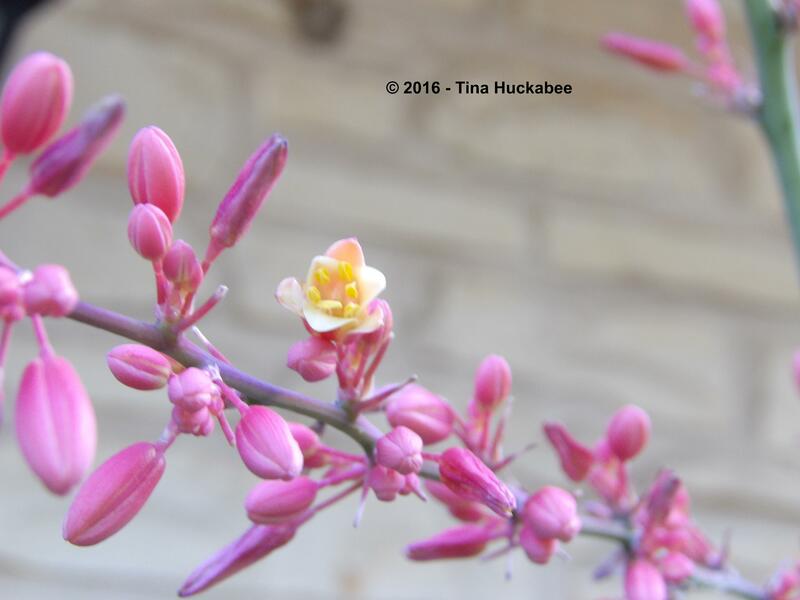 🙂 I agree that the yucca blooms–all of them–are stunning!